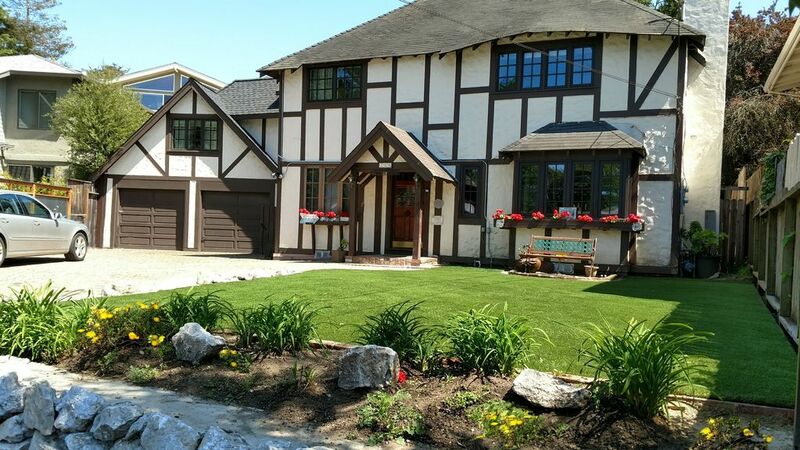 We had been looking for a family reunion home and just fell in love with this great Tudor style English Manor. It has been the place for many anniversary and 80th birthday parties for lots of great guests. Come celebrate your special occassion with your family and friends. More of our friends have vacation homes in the area can accommodate additional guests all within easy walk to the Rio Del Mar beach. Being that the Manor was just a short and level 3-4 minute stroll to the 7-mile sandy beach was one of the main attractions of this home. The fact that there were no other homes that could handle up to 14 adult guests & up to 8 children under 12, was another major factor. One of the largest homes near the large sandy Rio del Mar beach and the Seacliff Beach State Park with its famous wharf out to a cement ship called the Palo Alto. The only SwimSpa in a Vacation Rental in the area. The owners enjoy hosting a free Sea Chantey Sing-alongs for guests either in the backyard or at a bonfire at the beach. The 3 & 4 showers have unlimited hot water! The other bathrooms have one hot water heater each. We have never had guests run out of hot water. Home is a level 3-4 block walk to a delightful beach area with many upscale homes with beautiful gardens. Also a small commercial area next to the Rio del Mar's beach that has the great Pixie Deli - outside BBQ Tri-Tips, Chicken and great sandwiches and ice cream cones. Also a small grocery store, the white table clothed seafood restaurant the Rio Cafe, and a few other stores. Nearby there are Several Shopping areas, Deer Park with large Deluxe Food Market, several restaurants including our personal favorites the Panda Inn and the Bittersweet Bistro. Another area, just off the State Park exit is the Rancho del Mar Shopping Center, with Safeway, RiteAid, Ace Hardware and many other small shops & restaurants. The river runs into the sand at Rio del Mar, less than a 3-4 minute walk and is a fun play area for little kids. Cellphones work best upstairs or in the front yard. We do have a booster for Verizon. There is also a land line phone with upstairs and downstairs extensions. There are several fans, but even our 4-star Hotels do not have air conditioning as it is rarely needed in this great seaside area. Thermostats for gas fire-stove in dining room, gas heaters upstairs and electric wall heater downstairs in downstairs hall. (3) One in ground floor utility room, another in the additional upstairs Wet Bar, and the third off the ground floor of the West Wing downstairs bathroom. Two in the ground floor utility room, another in the upstairs wet bar, & the fourth off the ground floor of the West Wing bathroom. Also outside laundry lines at upstairs back deck for swim suits etc. Wood fireplace in Downstairs Front room with free firewood and starters provided. There are 5 - 8x18' parking spaces in the driveway. Comcast Cable Broadband with Free On-Demand Programming for form TV shows etc. There are 3-Flat Screen TVs that have ports for games if the guests bring them. Washcloths, hand towels and bath towels provide. Some beach towels, but best to bring yours. Each bathroom has a hair dryer. Ground Floor has 2-Queen Innerspring Futons, fireplace with free firewood & information area with lots of local activities & events brochures. This room is called the Family Room on the floor plan's. 4-Refrigerators total. 2 Full size refrigerators -1 in downstairs kitchen, 1 in Wet bar upstairs, and 2-small refrigerators, one in wet bar and one in West Wing. Oven is large enough for a 25-30lb turkey and we supply a large roasting pan that will fit almost any size bird or roast for Thanksgiving and other feasts. Three coffee makers in Downstairs kitchen, Assorted Teas in Tea Box. 2-Double-wide Toasters & an additional Toaster Oven near Microwave and Refrigerator in Kitchen. There is a popcorn maker in Upstairs Wet Bar area. Extra Toasters etc in Cushion Shed. Often guests leave dressings and other condiments. Full spice rack on counter, Coffee and a Tea box are also provided. Dishes & utensils for 28. 3- 36'to 42" Flat screen HiDef TV in Game Room upstairs, Another TV in downstairs Family Room, and a large Flat Screen TV in West Wing bedroom. 3 DVD players and many DVDs on shelves & VHS players and videos. There are books in all bedroom shelves. Each bedside has a reading lamp. Several board game and chess, checkers Dominoes etc. Plus the front lawn is all set for a game of Croquet with balls and mallets for 8 stored in the Causeway near the garden gate on a shelf. Assorted toys and sandcastle building forms for tots and the young at heart. Boogie Boards and a full size surfboard. The new Flat screen TVs have ports for most games if the guests bring theirs and the cables. A square balcony off the Upstairs back Queen bedroom with small table & several chairs that has a covered roof for shade. Also a laundry line for outside drying of bathing suits & towels etc. Kayaks can be rented from the Santa Cruz wharf and the Moss Landing which is towards the Monterey area about a 25 min drive. Boats can be rented off the Capitola Wharf. Upstairs covered porch with small tables & chairs. Also drying line for suits & towels. There are several tennis courts within 1/2 hr drive. Check out locations in the supplied Yellow pages. Seascape Public Golf Course is less than 1/2 mile away and there are several other public courses with-in a few miles. There are very expensive courses in Monterey/Carmel about 45-mins away. The back door has only one small step and we have a 12' metal ramp that can be installed to aid handicapped or wheelchair accessibility. It must be reserved and installed in advance. The first floor is all one level and mostly hardwood floors with some tile and some rugs. The downstairs bathroom had stainless steel grab bars in the bathtub and a large turning area near the toilet. ThermoSpa SwimSpa that seats up to 12 guests . Semi-Handicapped access, please call for further description. Also most guests really enjoy a day at the Monterey Bay Aquarium, about 45-min south, or a day at the Santa Cruz Beach Boardwalk with it's over 100 year old wooden roller coaster and it's handcarved horses on the Merry-go-Round that has rings that can be grabbed and thrown into a large clown picture who laughs when you get it in its mouth. Plenty of room for all of us. Overall we had a great stay. The Tudor Rose Manor is dated and a bit cluttered but has a large kitchen eating area, lots of rooms and beds, and is in a great location. We enjoyed the front "lawn" (tho were not able to sink the crochet into the turf lawn), we barbecued (it was left very dirty so we had to clean it before our use) and we spent a lot of time playing cards in the large eating area. The house is dated and we had some plumbing issues because of that. The owner responded quickly and a plumber came and fixed the issues. The rental price led us to believe it would be in a better shape. It got the job done and we had a great family reunion.